It is Sunday morning. Hopefully you will wake up well-rested, stretch out your arms, and open your eyes to a sunny day. Maybe you will have a warm cup of coffee, some eggs with toast, or maybe you will even get really lucky and have some homemade pancakes. After that you might relax with the Sunday paper, catch up on the news, or watch some cartoons with your kids. Of course, you will do all that while still in your comfy pajamas. On Sunday morning, you can rest easy because the next work week is still a distant 24 hours away. As the day wears on, you might run some errands, meet a friend for lunch, or do some laundry. But by Sunday evening, you will have the unfortunate revelation that Monday morning and that-thing-that-shall-not-be-named (ie. work) is right around the corner. You will start gearing up for the week, thinking about what you need to accomplish, what you will wear for work, and hopefully you will think about what you will eat for lunch during the week. Maybe you have a catered meeting on Tuesday, and lunch with a co-worker at that new burger joint on Friday. The other days you will probably bring your lunch, and I would wager a guess you will eat sandwiches, leftovers from the night before, or healthy portable foods like fruits, yogurt, or hummus. Some days if you are extremely busy, you might not even have time to eat lunch at all! Am I describing your week about right? I wouldn't call myself a fortune teller, but I can also reasonably predict that by the time 3 or 4 o'clock comes around, you will be looking at your watch - your eyes will bulge with astonishment as you realize there are still several hours to go and lots of work to be done before you can eat dinner, and you are hungry. Your energy from lunch is gone (if you had time to eat anything at all) and you are seriously contemplating a vending machine run. It is a situation of serious food desperation, and we have all been there. B.) You have failed to anticipate you would be hungry. C.) As a direct consequence of B., you have no food on hand. D.) You anticipated the hunger strike, but had no time to rustle up some grub. Ok fair enough. But since this problem occurs on a daily basis for most people (and amnesia is not currently an epidemic), fact B. is clearly ridiculous. If you are honest with yourself, I am sure you can agree that you know you will be hungry. So really, the reason we suffer through these late-afternoon snack monster attacks is that we don't take the time to prepare. I know we all have busy lives full of very important things to do, but let me tell you how you can feed the snack monster with something healthy and delicious that will give you the energy you need to finish the day strong. You can make it in 5 minutes over the weekend, and these snacks should last you for 2 weeks in the refrigerator. Now that sounds like quite the payoff doesn't it? 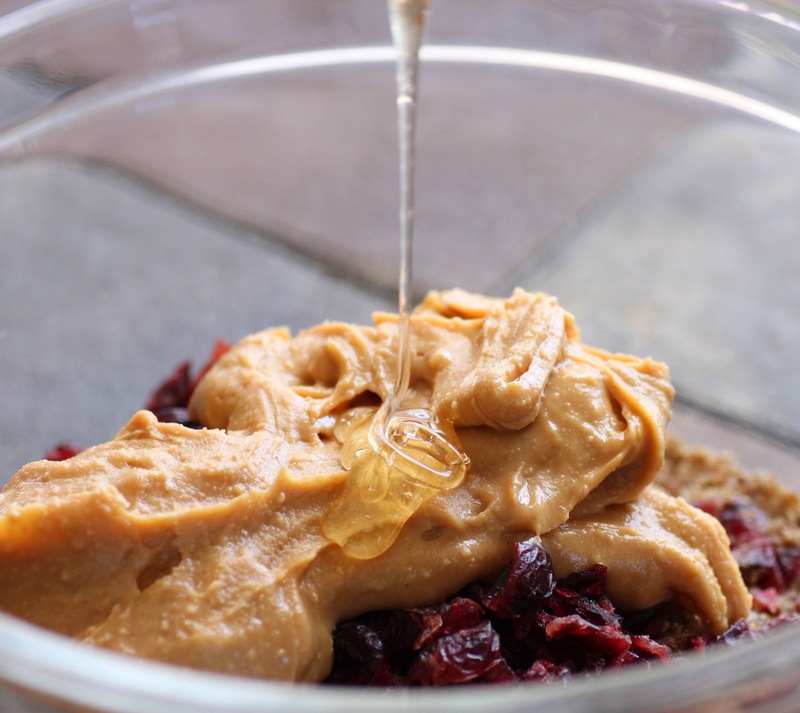 By simply combining peanut butter, whole grains and seeds, dried fruit, and a bit of honey, you have a no-cook snack that is made with ingredients to specifically give you energy. 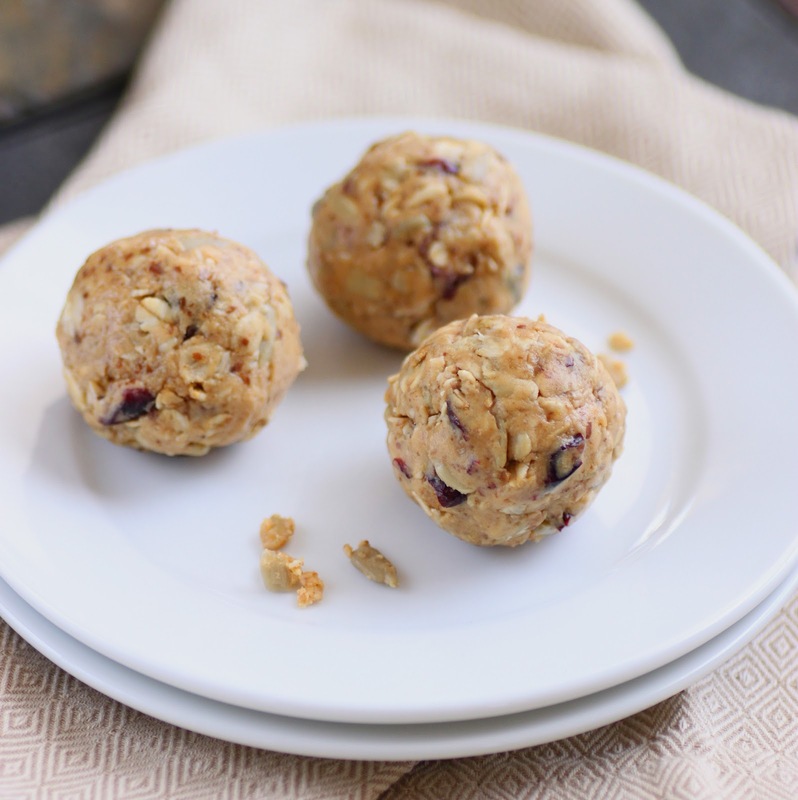 These bites are especially packed with protein from the nuts and seeds, but also have healthy oils, more natural sugars, and obviously no preservatives or strange binders/additives. They are just sweet enough to feel like an indulgence, but not enough to spoil your dinner or turn away savory/salty snack fans. 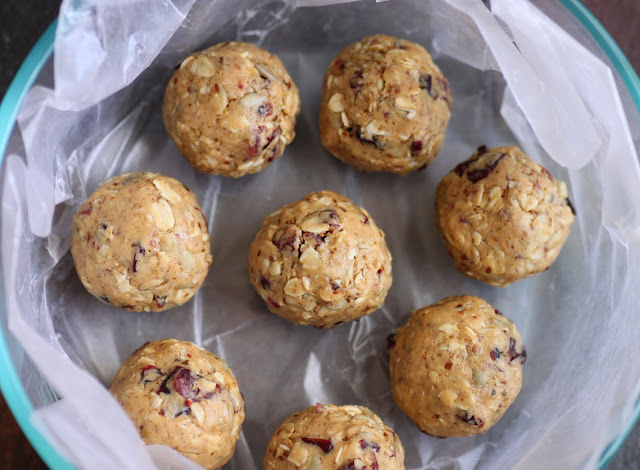 Since they are extremely easy to make - just mix the ingredients together and press and roll them into balls - you can actually make this a fun family activity for the weekend and include them in kid's lunches too. Wasn't snack time invented in kindergarten? But let me tell you what I like the most about these snacks - for several reasons, you will only want to eat one at a time. Since they are kept cool, you will need to go all the way to the refrigerator to get one, making it less likely you will go back for seconds (as compared to eating chips/cookies/candy that can be kept in an desk drawer). Also, they are about 2 inches in diameter, which makes them big enough to satisfy but still small enough to be just a snack. And lastly, the peanut butter makes them slower to eat and chew, so it would be almost impossible to rapidly eat them in multiples (though I won't stop you from trying). So this weekend, before the work week starts, be good to yourself and your tummy and get prepared to deal with late afternoon cravings or energy crashes. You will be able to finish your day with more focus, more productivity, and less stomach growling. All good things in my book. Mix all the ingredients together in a large bowl, making sure to evenly distribute all the ingredients. 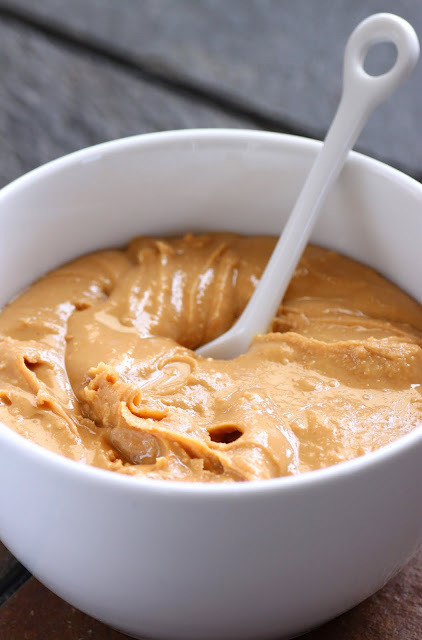 Take some of the dough and press it together between your hands - if it sticks together well, it is ready to go, if it feels too dry then add a bit more peanut butter or honey. Likewise, if it is too 'wet,' add some extra oats or flax. 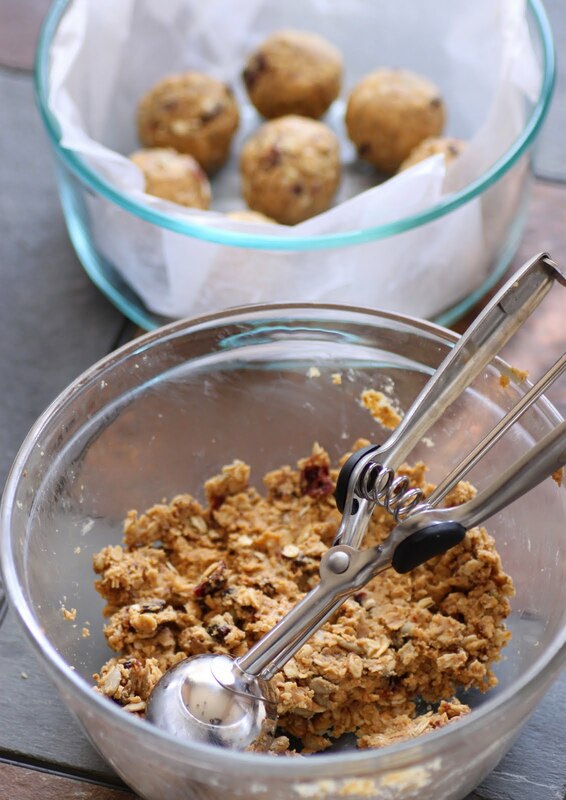 To form the dough into a small bite, use a spoon or a cookie scoop to portion out the dough, squeeze it between your hands, and then gently roll it into a ball. This amount of dough makes 12 bites that are about 2 inches in diameter. Store the bites in an airtight container, and keep them refrigerated until eating. Bites will keep for 1-2 weeks refrigerated. *Feel free to substitute other dried fruits if you like such as apricots, mango, or apples, or you could take this a totally different route and swap in carob or chocolate pieces. I love the look of these. And...wait...I think I have all the ingredients on hand! Yay! These are going to get made TODAY! Thanks for sharing! Terrific and so addictive! I really lopve the idea. I love these kinds of snacks! Lately, I've been really into making different versions of dried fruit and nut "truffles" and they really do stave off hunger. These bites look fantastic! It's funny how easy it is to forget to have energy boosters like this on hand. I develop a particular kind of ravenous in the afternoons, due, I think, to being a breastfeeder (not me, my baby). I'll try making this with a slight variation that takes me back to my favourite childhood snack: dried pears spread with cashew butter. I think those two ingredients would work beautifully with your oats too. Thanks for the reminder! Totally making these today. Yum!! you nailed it - SO many times I am hungry without anticipating it... I get shaky and ... short. :) (Jason has learned to detect it quickly, telling me I need food!). I love these kind of things, and your recipe looks delicious! These sound tasty, healthy and a perfectly filling snack. Bookmarking to try soon! What a great snack and so easy to whip together. Yummy. These look fantastic and such a great snack to bring to work! Nicely done! Now that I'm over my morning sickness, I'm hungry all the time! I've been making a list of healthy snacks to post on my fridge for inspiration, and these will be a perfect addition. I volunteered all day today w/o a meal! I could have used a few of these bites! Can't wait to make these for my BF- he will love them! YAY!!! So glad you were able to find a combo that worked for you...and I'm so happy you enjoyed them :) Hope you have a great week! Great idea on these, I plan out every calorie! This is great! I love all those ingredients individually and together! Such a great combination of ingredients, and so easy to make too! This is a great snack option to have around during the week. I LOVE LOVE LOVE this idea. These are totally right up my alley. I think I have all these ingredients at home, too. Thanks for sharing. I'll definitely be making these soon. I just analyzed the recipe: approximately 180 kcal per serving (out of 12 servings). Thanks for the great recipe! These look great! I am going to try these next weekend. Somehow I got addicted to cookies and need to slowly (very slowly) find another snack. Thanks for sharing! We had something like this when I was a kid but Im sure it wasn't as healthy. I can't wait to try these. Fantastic post, Amanda. The combination of peanut butter, fruit, honey & grains sounds far too good to pass up! You're right, I *should* be good to myself and make this, especially as I often forget to eat all day and then have near fainting spells in public places... whoops. Maybe I'll even make some to give to my newly acquired wifey (best friend) who has moved in with me temporarily, to take to work with her. I think she'd appreciate the gesture! So excited to give these a try! Oh this reminds me of my current state of hunger! hi. im definitely going to make this. just a question, the rolled oats are not cooked? not even toasted? Yum. I might try making a version of these with my homemade granola! Fhei: Nope the oats in my recipe are not cooked or toasted, but I bet it would give a delicious flavor to toast the oats before adding them. Give it a try and let me know how it turns out! I made these today. I made a few adjustments to our preferences- like adding more fruit and different kinds of nuts like chopped up cashews. I was out of flax seed- ground or otherwise. So I just added a bit more oats and mulched them in my mini food processor til they were fine but still had some large bits. My boyfriend loved them too and he doesn't normally enjoy anything oat-y. Thanks for the recipe!! Oh My!!! What a perfect little ball of goodness!!! This would be perfect for my kids and their busy activities. I find myself looking at that clock every day at about 2:14.... These are definitely going to be a hit with our family!! Yum! What a great idea for a make-ahead snack. My hubby has been trying to take healthier snacks to work and this would be perfect! Love the flavors here with the pb, honey and sunflower seeds. mmm, I was thinking I should try and find myself a new afternoon snack as I've been slacking off and buying granola bars, thanks for this! I made these this afternoon... they're SO GOOD! They taste like raw cookie dough - but without the guilt afterwords! I'll definitely be sharing this link AND making them frequently. Thank you! Sonrissa and Laura: Glad to hear you made them and loved them! A few other readers have commented on Facebook or emailed me to tell me they made these and really enjoyed them. I actually just finished off the last of mine yesterday afternoon, and so I have plans to make more this weekend. 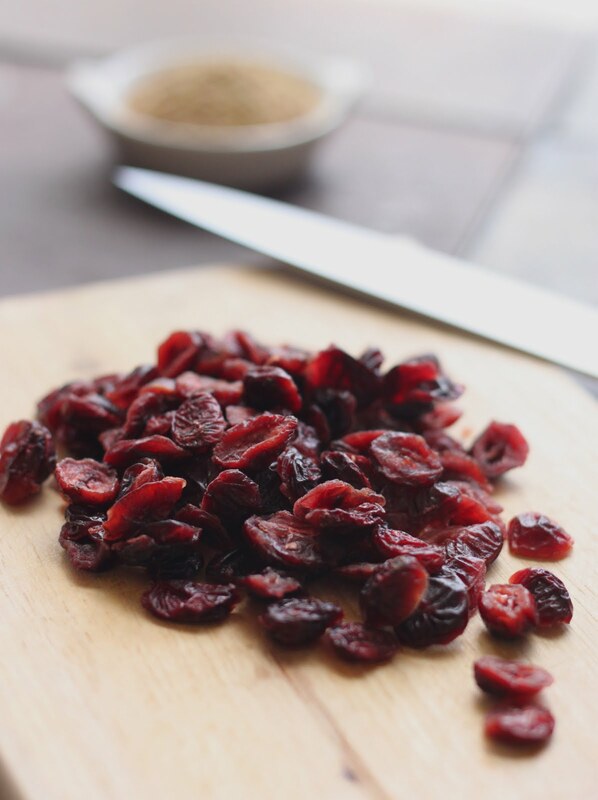 I think I might try a different dried fruit (tart cherries or apricots? ), happy snacking! What a fun snack! If only I had a dollar for every time I could use a little energy bite to hold me over at work. What a wonderful, healthy snack on the go! These are so creative. Thanks for sharing. I hope you have a great weekend! Amanda these little balls of goodness look amazingly delicious:) I have to feed my youngest some concentrated, but good snacks (she has Type 1 diabetes), and these look just right. Thanks! I made these today and they were amazing! I substituted chopped pecans since I didn't have sunflower seeds. Thanks for the healthy and inexpensive snack that is perfect after a long run! These look great. I'm on the 17 Day Diet right now so these would be great with a few substitutions. I am so excited! Great idea. I'm always looking for healthy snacks that add some good protein to my day. I'm going to give them a try. Just made these treats - not only are they super easy to make, but delicious as well! Perfect snack to munch on!! Wondering what the nutritional content on these might be?? Yasmin: Always glad to have a new reader and thrilled to hear you loved these! I just made these and they are one of the best things I have eaten! Bonus is my two boys love them too. Thanks for a great recipe! LOVED THE RECIPE !!!! EASY AND SOPHISTICATED TASTE AT THE SAME TIME . WILL BE DOING THEM REGULARLY ! these look great but they're a whopping 153 calories per ball! don't eat too many on accident or you'll have to spend and extra 30 minutes on the elliptical. yumOOOO!!! Anonymous: Actually I think they are a bit more than 153 calories each - I calculated 160 and another reader calculated about 180 calories. Either way, since most people eat at least 2,000 calories per day to be heatlhy, I think this is a great amount of calories for a late-afternoon snack to keep you going. The protein especially helps to boost energy! Hope you enjoy! Made mine with walnuts because I'm not able to find unsalted sunflower seeds at the moment. Very yummy! Thanks for a great recipe! This is perfect for a "quick pick me up!" snack. I'm doing Weight Watchers, and put this in the recipe builder; they come out to 4 points plus, not bad considering the size. :) Thanks! made these today...sooo good!!! thanks! I made them with dried wild blueberries and they were delicious. Many variations could be possible here. 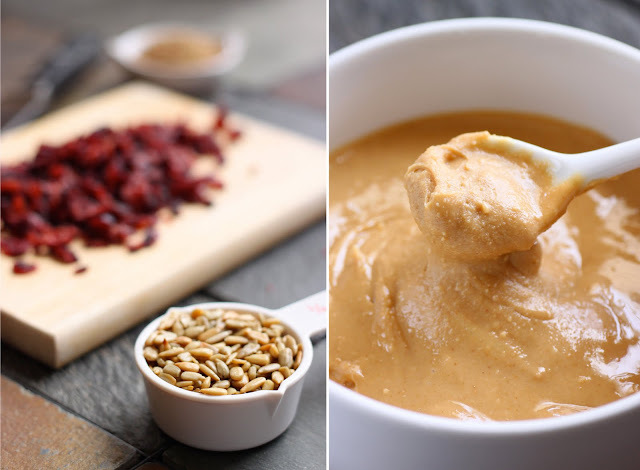 I think I will try almond and cashew butter versions and changing up the nuts as well. I can even imagine a little nutela with hazelnuts for a special treat. can buy and download from the internet. Make sure your kitchen is fully stocked with the foods you need to eat. ويجيب على تساؤلات عملائنا الكرام خبراء على أعلى مستوى حيث يقوم خبراء شركة تنظيف بيوت بالرياض والمتخصصون في مجال التنظيف والصحة العامة على تقديم إجابات وافية على استفسارات عملائنا وتقديم حلول للشكاوى المقدمة وسط الحرص على استخدام أحدث التقنيات وبالاعتماد على مواد طبيعية تحافظ على صحة الإنسان ولا تكون عبء على ميزانية المنزل.